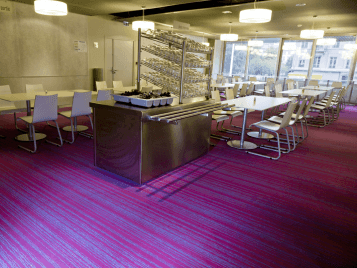 What you choose for the colors of your office can have a dramatic effect on your clients and other visitors. These effects are subliminal and instinctive, creating either a good or bad perception of your business. The colors you use in your office should change with the type of business being conducted in the office. Your image is being projected, and judgments being made, the moment your door is opened. The right choice for your office colors can ensure that your image is a positive one. With general office space you need to understand the messages of the colors you choose so you create the effect you want. Blues and greens will keep a calm atmosphere, but too much of these colours and staff productivity may slow. Adding a small amount of red, orange or yellow somewhere in the space will increase the energy flow and enhance productivity. Too much red and aggression and anger may be the result, too much orange or peach color will create a social and talkative atmosphere, while too much yellow will cause anxiety and stress in some. Turquoise, the colour of creative and mass communication, in light to medium tones, is appropriate for walls in training rooms. Turquoise helps in calming the nerves of public speakers and is a good color for teaching. Printing on yellow colored handouts assists recipients to retain what they are reading. Some yellow in front of participants who are participating in the training, either on the wall or behind a teaching board, will help them to retain what you are teaching.